In my mind, Memorial Day is the start of summer. This past Memorial Day was quite hot & humid, so it definitely felt like summer. And when it's summer, I like to grill. Less mess in the kitchen. The oven doesn't add heat to an already hot house. Tasty food out on the deck. Adding to my sense of summer and the urge to grill was the arrival of the recent Saveur issue. On the front cover was a photo of ribs and the words 'BBQ Nation." Opening and reading the issue just made me crave BBQ that much more. 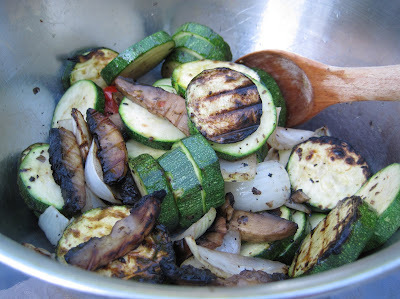 I love reading about all the different kinds of BBQ - the different woods used for smoking, the cuts of meat, the rub recipes, the sauces (tomato-y or vinegary), the side dishes. It made me want to hop in the car and take a road trip to Texas, Memphis, Kansas city -- somewhere renowned for its tasty, smoky, BBQ. But a road trip was not possible. I had to get my fix elsewhere. 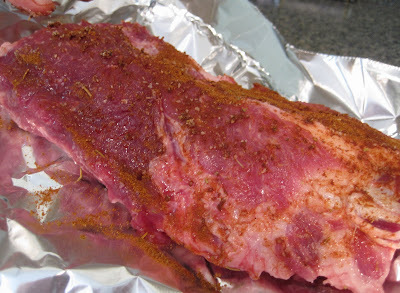 It wasn't too difficult to get SP to agree to some baby back ribs for one of this week's meals. Last September, we visited EPAS and her family. They live past Lancaster, the same distance from Philadelphia and Baltimore. It is very rural where they live, quite a change for SP & I, but so beautiful with all the farmland and Amish buggies and just so much space and green and no crazy over building & development like here in Robinson. On that visit, she and her husband made us some delicious food. The food that really stuck with us was the ribs. 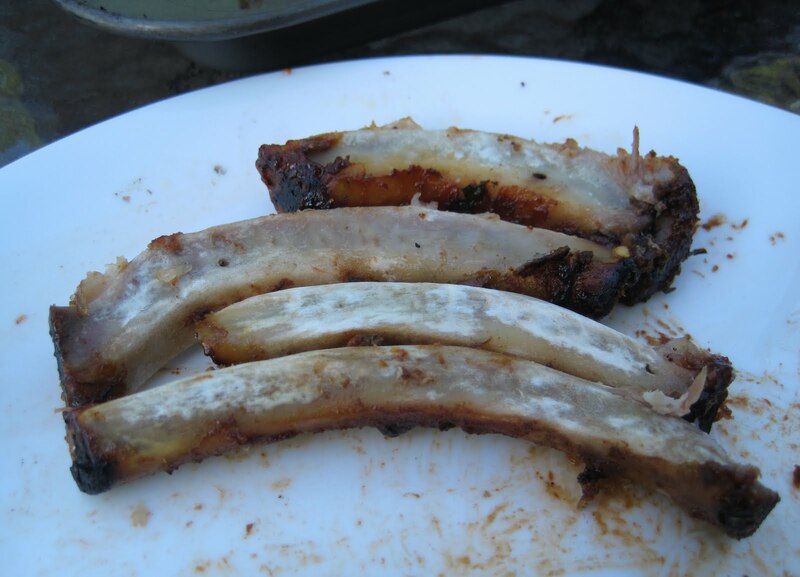 They were so moist and tasty, much tastier than the ribs we usually make. EPAS was kind enough to print out the recipe for us. 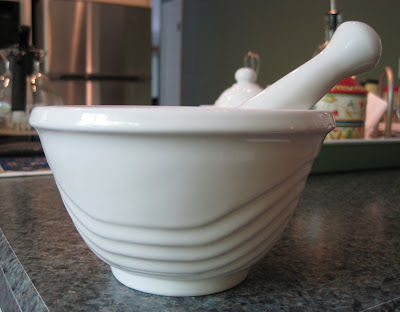 Plus, making our own rub gave SP the chance to finally use the mortar & pestle he wanted (and that we received as a wedding gift): We loosely followed a grill rub recipe I found online here. We wanted to get the basic proportions correct. 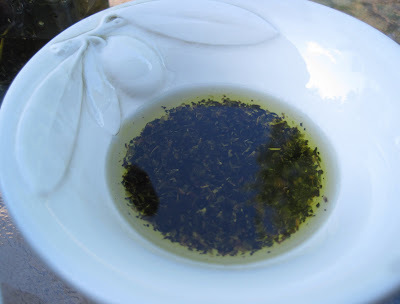 We used ground sage, not sage leaves. 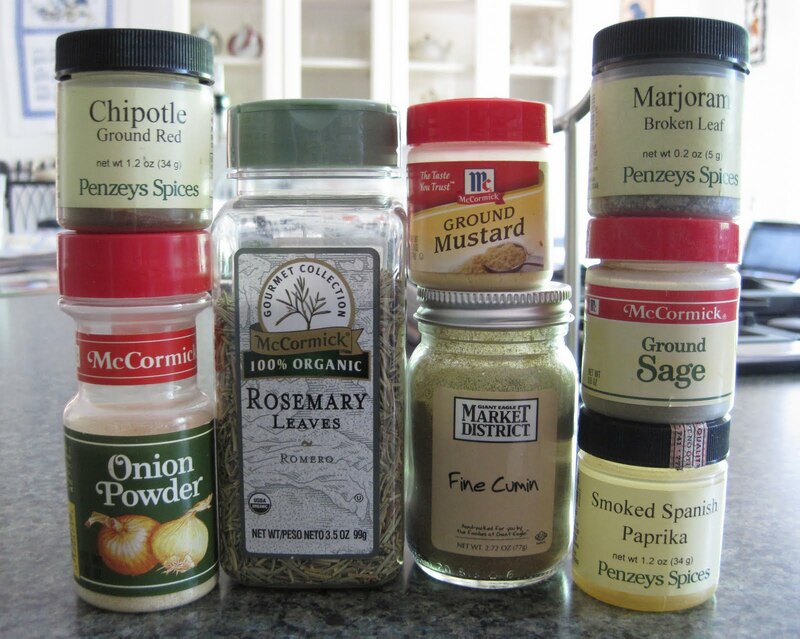 We omitted the garlic powder and tomato powder. 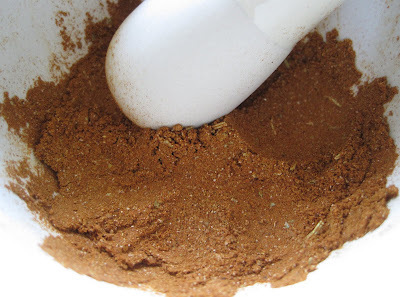 And we used brown sugar instead of palm sugar or jaggery (which I'd never heard of before). Then it was time for the ribs. Of course we bought them at Costco. A huge quantity. So SP separated them and we froze three half racks and we cooked the other three half racks. You have to make sure to score the backside of the ribs with a knife in an 'x' pattern. Then we sprinkled the ribs (both sides) with Kosher salt. 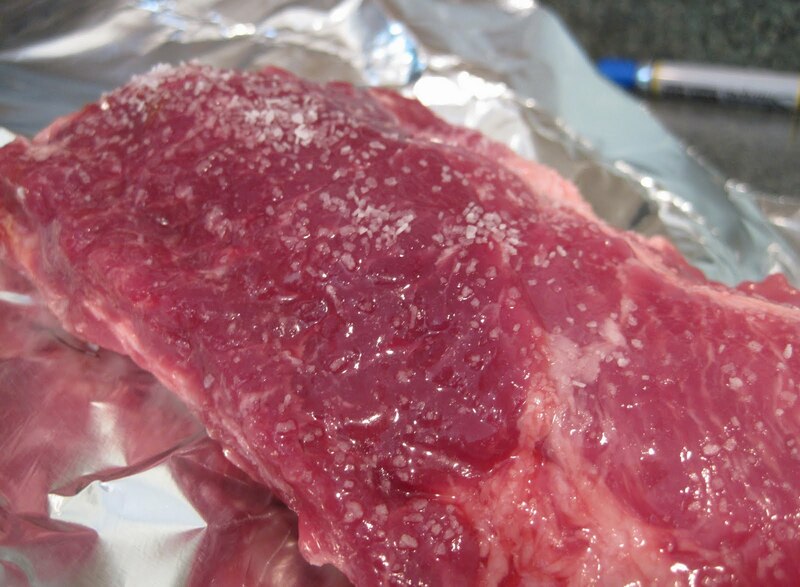 You could see the salt crystals glistening on the meat: Then I sprinkled on the rub and SP actually rubbed it all over and into the meat (be sure to do both sides): After rubbing in the salt and spices, SP carefully wrapped each slab in foil, making sure to tightly seal the seams. He left a small opening at one end. 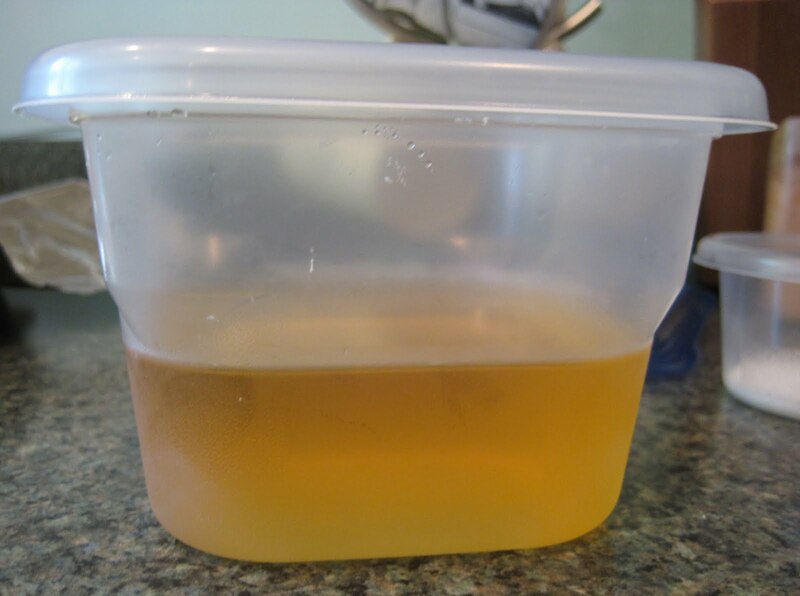 The opening was so we could pour in the apple juice: We don't drink apple juice, so he bought a can of frozen concentrate and made half the can. I'm not sure how much we actually poured into each foil wrapped slab. Maybe 3 tablespoons? The official recipe says 'few tablespoons,' so again, use your best judgment. After we poured in the juice, SP sealed the opening, arranged the 3 foil packets on a cookie sheet, and placed them in a 225 degree oven for 4 hours. Low and slow cooking. Meanwhile, it was time for cocktail hour(s). 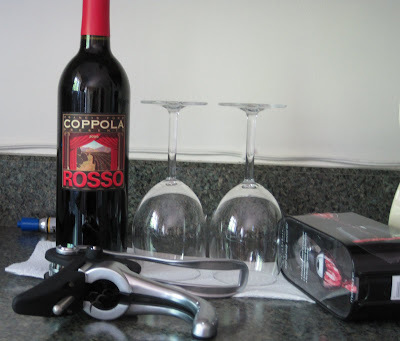 We opened a bottle of Coppola Rosso, which is one of our favorite not too expensive red wines. After 4 hours in the oven, it was time to move on to the finishing steps for the ribs plus to make our side dishes. 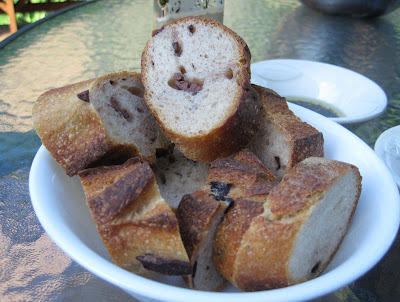 To make life super simple, we bought one of the olive baguettes at Giant Eagle Market District: We dipped the baguette slices in a Sun-Dried Tomato and Basil Olive Oil: As we munched on baguette, sipped wine, and enjoyed the beautiful weather out on the deck, we also got the vegetables on the grill. 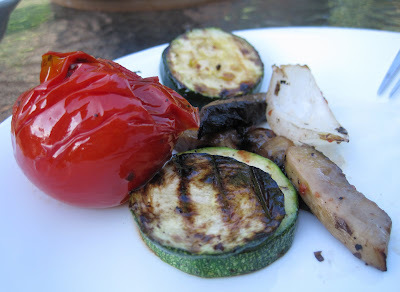 Zucchini, tomatoes, onion, and portabella: SP decided to try grilling some of the CSA kale. It didn't work out. Maybe if he had stood right over it and watched it the whole time, but since he wandered off and left the grill unmanned a little too long, the kale ended up like this: Whoops. 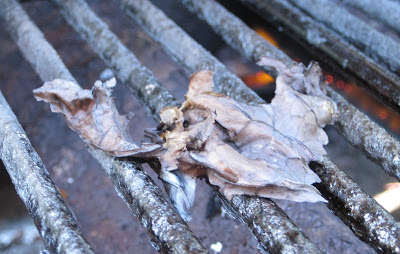 It looks like a brown leaf landed on the grill! We also gathered our bottled BBQ sauces: plus a container of a homemade sauce SP made. Here are the post-oven, pre-grill ribs: To finish the ribs, place them on the grill and slather them with any BBQ sauce you want. Soon enough, it was time to enjoy it all. 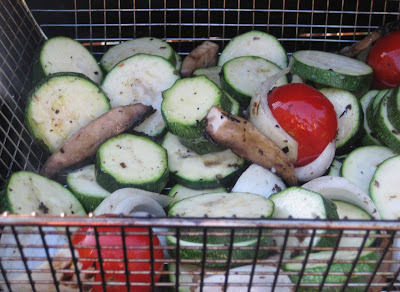 A bowlful of grilled veggies: Closer view of some grilled veggies: I really like tomatoes cooked on the grill. These were the last few from the package SP bought at Costco a week earlier. They were very juicy tomatoes and when I cut into one, tomato juice ran all over my plate. That was OK - I just used some baguette to mop it up. 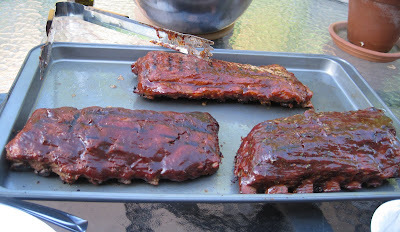 The finished ribs: In the back is the one slathered in Peach Grilling Sauce. That sauce was a gift to us from my family in Georgia. It's sold at the General Store in the town in which they live. Front left is Jack Daniels Original No. 7. And front right is SP's homemade sauce. These were fall of the bone moist and tender. No need to use a knife or to pick them up with your hands and get yourself all greasy and sauce covered. The meat just flaked off the bones with a fork. I liked the Jack Daniels sauce. 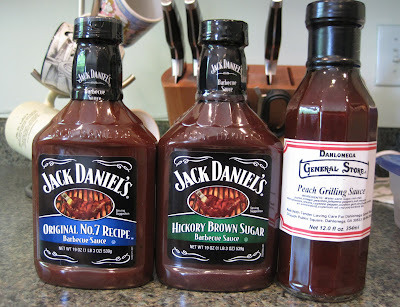 Usually we buy Sweet Baby Ray's BBQ Sauce for me, but we had some coupons for the Jack Daniels, so we decided to try it. I also liked SP's homemade sauce, but it had a much more ketchup-y flavor than the other sauces. The peach grilling sauce was delicious, maybe my favorite, but wow does it affect me! I didn't expect it to be so spicy! I'm glad it wasn't super peachy because usually I don't like fruity flavors on my meat. This sauce definitely had a bit of peach flavor & sweetness, but it wasn't an overwhelming fruity flavor. Unfortunately, after my mouth got super tingly, I looked at the ingredients and discovered that the peach grilling sauce contains jalapeno, cayenne pepper, and red chili puree. 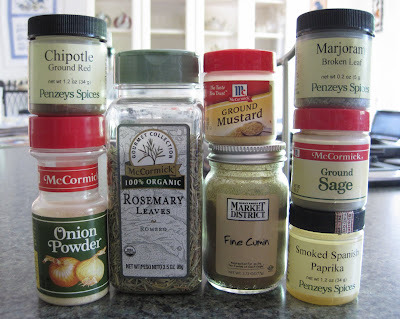 Yes, I am a spice wimp, so yikes! And yet despite being a spice wimp, I couldn't stop picking at the peach ribs!!! The sauce's flavor was just so good! I did pay for my spicy indulgence later on with heartburn, stomach distress, and a lingering spicy taste in my throat. It was definitely worth it... this time. I don't think I'll indulge in the peach sauce again, even if it was my favorite sauce! I don't think we'll ever go back to our old way of just throwing some ribs directly on the grill and slapping on some sauce. 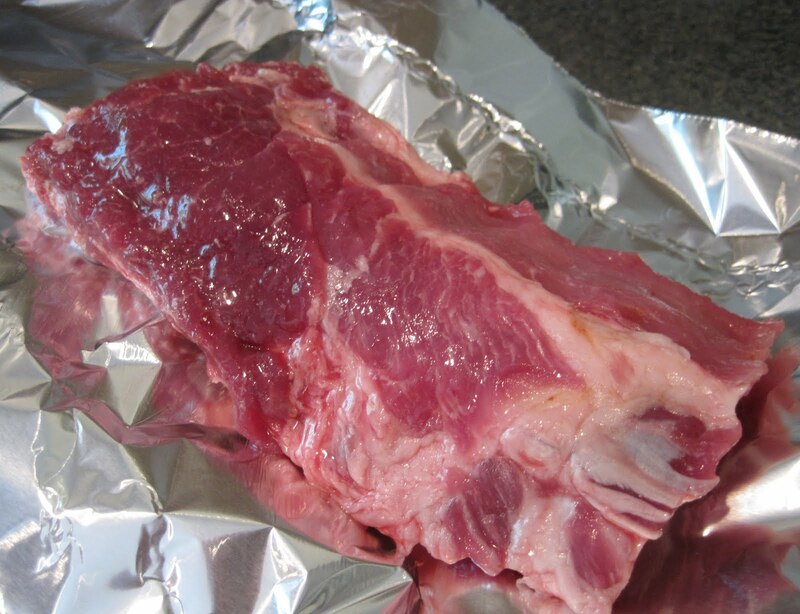 I think we will take the time to cook them low and slow, wrapped in foil and with apple juice inside the foil packets. It's not difficult to make the packets, once they're in the oven they don't require any 'active cooking' time, and the moist fall off the bone tenderness is well worth the effort. 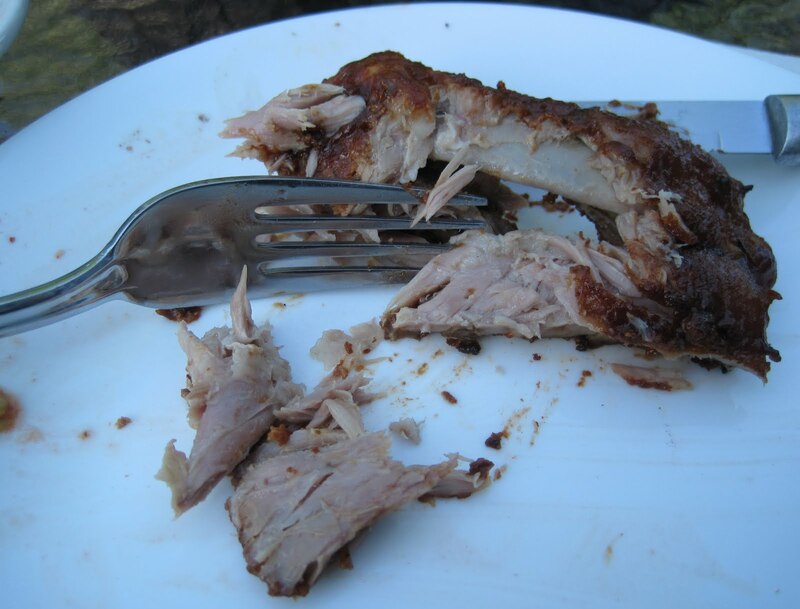 It may not be what a pitmaster considers true BBQ - after all, our ribs involved neither smoking nor wood, but for making it at home, this recipe makes the best made at home BBQ ribs we've had. 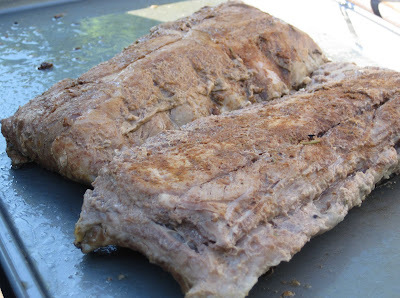 We're so glad EPAS and her husband introduced us to this rib recipe! 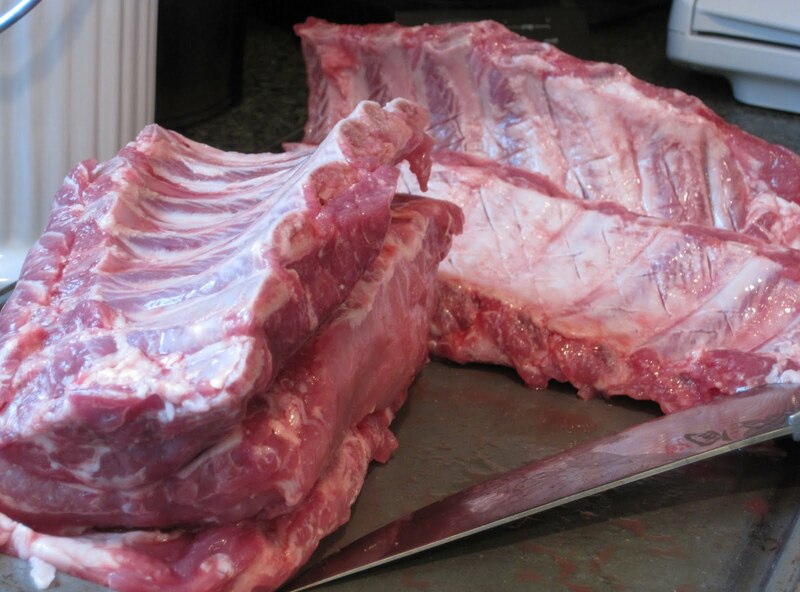 And glad that EPAS' husband's father & brother introduced them to this rib recipe. 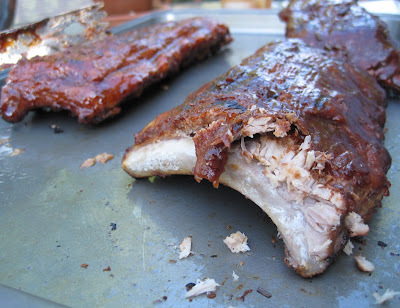 Your ribs look SOOOO good. Glad the recipe worked out for you. Guess what we're cooking this weekend! ?